Are you getting your pumpkin on yet? I love pumpkin…you name it – pumpkin pie, pumpkin smoothies, pumpkin ice cream, and even pumpkin soup. Eating pumpkins and picking apples are hands-down two of my favorite fall traditions. These fall favorites become that much more special because we only do them once a year. 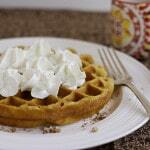 This year, I tried something a bit different (for me anyway): pumpkin waffles. 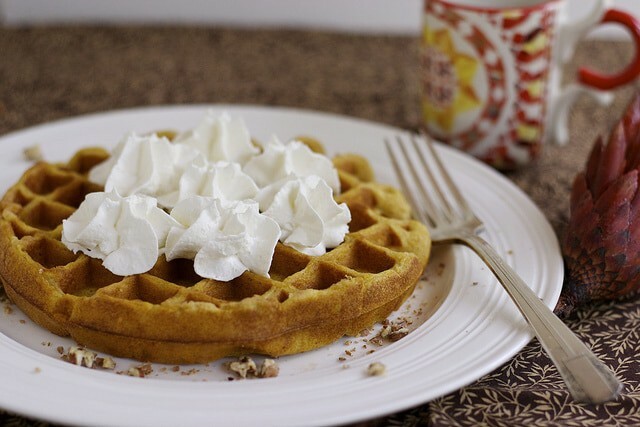 I took a basic waffle recipe and adapted it by increasing the sugar and adding pumpkin, cinnamon, nutmeg, and one of my favorite ingredients – Philly cream cheese. When I make these waffles again, I will substitute the white sugar with brown sugar as well (I used white sugar for this recipe). I topped these with sugared pecans and whipped cream. My daughter even ate one with vanilla ice cream. We really enjoyed these! They went quickly….